Yesterday we spent a lovely few hours up the mountain at a family bbq to farewell some British visitors. The gathering of family and friends was joined by some of the locals...of the non-human kind! 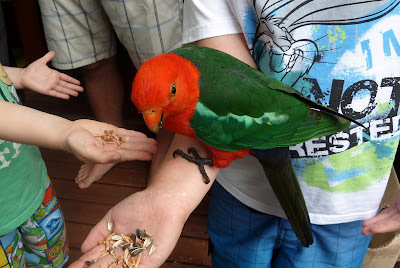 This is an Australian King-Parrot, and if Sibs was next to me she would tell me his name. I know it's a male as the female has a green head, but otherwise they all look the same to me! I think this one is Bert? My Sis in law is a bit of a Dr Doolittle and animals are just drawn to her. 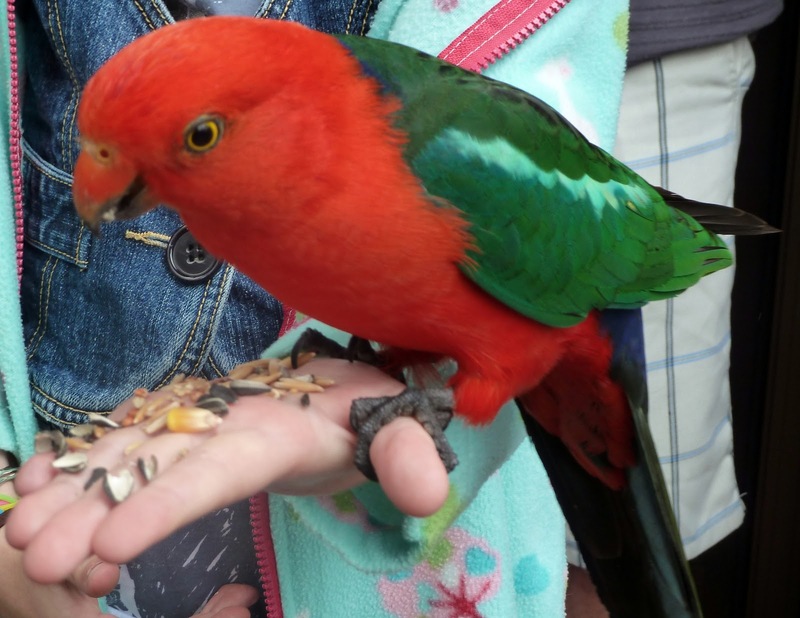 She has researched the feeding habits and requirements of the local birds and has calculated just how much she can offer them without disrupting their natural feeding. It's better than Australia Zoo at her house! 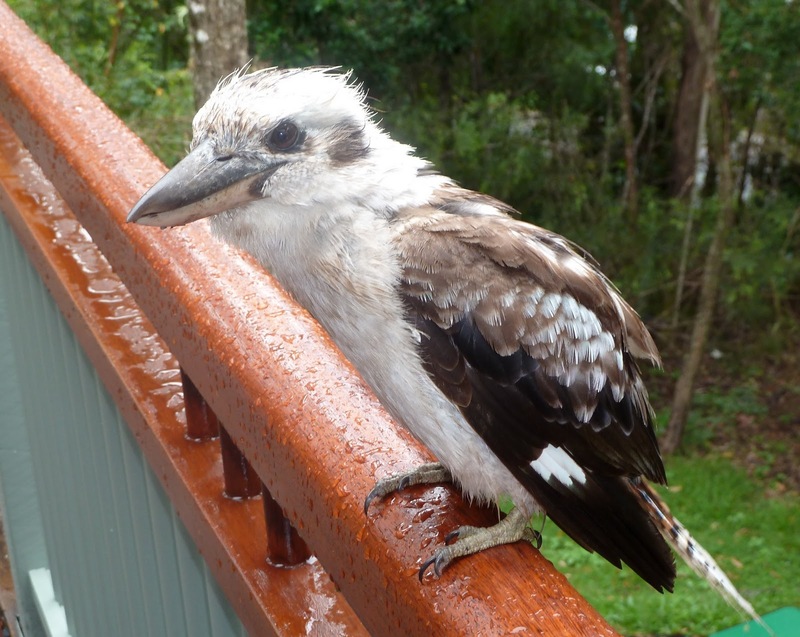 Whilst everyone was chatting this rather wet and bedraggled looking Kookaburra arrived to join the party. He looks quite charming don't you think? Almost as if he's smiling to himself? Quick, one last photo to show my wonderful feathers before I swoop on that rather juicy piece of steak...! I unfortunately missed the act of stealing the steak, but I heard the commotion. 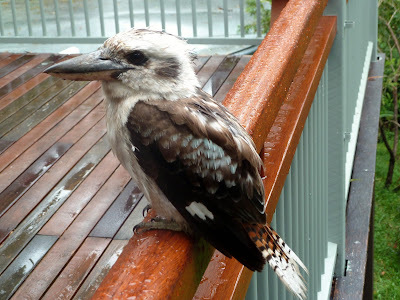 The kookaburra didn't get very far as the piece that he chose was almost his size and he dropped it just before he flew over the side of the deck. Oh well, maybe next time. 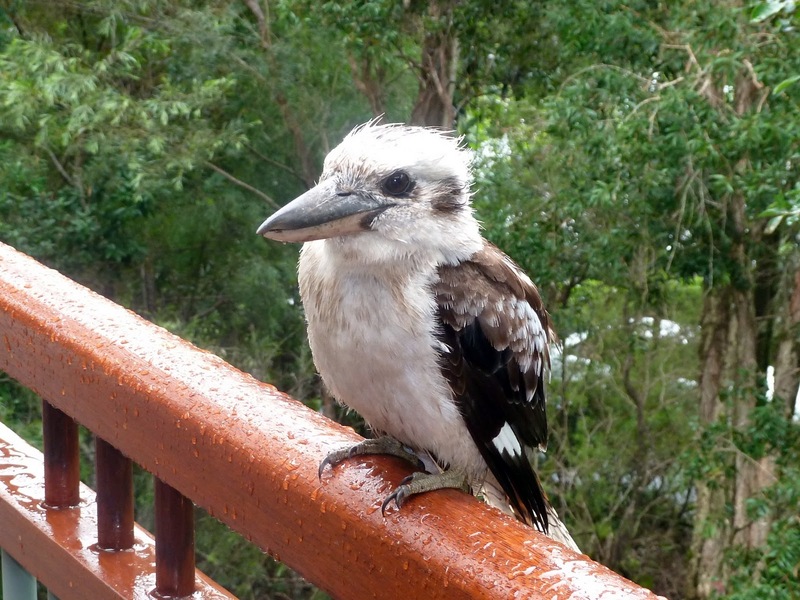 The local Kookaburras have a very distinctive call - it's called a laugh. It's a little like "kook-kook-kook-ka-ka-ka﻿". I love to hear them, it's so different to any bird call that I've ever heard before. Talking of different sounds, you should hear the racket that the cicadas make here! Most evenings you can hear them singing. Quite often if I'm on the phone I have to go indoors as the sound is so loud. Thankfully they tend to only sing during dusk and early evening. Now it's quite tricky to spot a cicada and I've only ever seen a couple. 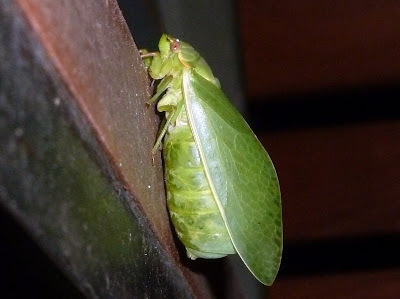 However, when you're up the mountain with Dr Doolittle you never know what will drop by and last night there it was - a beautiful green Bladder Cicada. Now that I've seen it, I can understand why they are so tricky to spot - aren't those wings great camouflage? On the way home down the mountain, apart from (once unsuccessfully) avoiding the pot holes caused by all this rain, I also had to avoid the tiny little frogs hopping all over the place. It reminded me of before we moved here, night driving along the country lanes in North Yorkshire. Except instead of avoiding frogs it was small baby rabbits. Thank goodness we lived out in the sticks where it was quiet, as I spent quite a bit of the journeys swerving all over the place. I can proudly say that I don't recall one mishap. First, all the best for 2011! I love reading this post, would like to go to Oz myself so badly, so reading your blog helps me seeing it a bit. Enjoy, sorry about the rain, that is not normal for Brisbane right?